Do you ever think about how you will be remembered once you’ve departed this life? I must admit that I do, but only in terms that involve my grandchildren. I wonder how they will remember me. I know how special my Grandma Copeland was to me, and I can only hope that my grandchildren remember me in some small way similar to the way I remember her. There are many people who want to leave their mark on the world simply because of wealth and all that goes with it, including political influence. And in some cases, many financially well-to-do folks are able to do what might be perceived as accomplishing that very thing. I happen to disagree. I recall, as a grade school student, having to memorize the names of all the Presidents of the United States. The majority of them I know absolutely nothing about. That doesn’t necessarily mean they weren’t significant leaders while in office, to the contrary, it might just mean that I did not absorb some of my history lessons. On the other hand, what did they do while in office other than having the name of President? I don’t personally know anyone who has ever worn the title "President of the United States" and don’t ever expect to, but that suits me just fine. I don’t move in those kind of circles. I suppose the closest I’ll ever come to knowing someone who has the title "President" is through my brother, Phillip McCormick, who serves in that capacity with the local Chamber of Commerce. That’s more my speed. But while I’m writing about my family, I don’t need to stop with just Phil. My sister, Sue, was married to a very respected man who served for many years as chief of police for the town of Livingston, the late John Tom Poindexter. John Tom and Sue had a marriage that is probably considered old fashioned nowadays, and by that I mean, John Tom preferred that Sue stay home and be a wife and mother while he went out and made the living. That’s an admirable and very worthy way to live, and is one that is practically obsolete today. Sue did an excellent job with her role in life. I remember well when they lived in a neat and tidy little flattop home on Goodpasture Street. I have a lot of happy memories of my visits there, especially when their daughters, Jacquelyn and Teresa, were small. My younger brother, David, rose from the ranks of a mere part-time employee for country music legend, Mr. Ernest Tubb, to go on to become the sole proprietor and owner of all the stock in the Ernest Tubb Records Shops. And I don’t need to leave out my sister-in-law, Phil’s wife, Betty. She wore the title of Executive Vice-president of American Bank and Trust for many years and is still sadly missed today by many of the bank’s customers since her recent retirement. I’m very proud of all my family members. When I think back on people who have touched my life in some way, in addition to my family mentioned above, these people come to my mind. My mother would have to be at the top of the list. She raised four good children practically all by herself and did what I think was an excellent job. Her life was not an easy one, especially in the later years of her life, but she was a very good mother. I loved her very much and I’m thankful for her influence in my life. A person I often wonder what ever happened to is a Sunday School teacher I had when my family attended the little First Baptist Church that once stood where the old library recently moved from. Her name was Earline Hargis. She was a gentle little lady and always tried to make her classes interesting to the younger children she taught. She once gave all the members of the class a tiny white Bible that contained selected Bible verses. I remember also how each member of her class had an attendance chart on the wall of the Sunday School room that was a picture of a green pasture and hillside. For every Sunday each member was present, a tiny white sheep would be glued onto the hillside. My chart always had lots of sheep because we rarely ever missed a Sunday service, either morning or night. Someone else I’ll always remember was a cousin by the name of Kay Carlos who lived in Kentucky. I only saw her a couple of times a year, but the way she touched my life was through her mother, Cola, a daughter of my Great-Aunt Allie Draper McCormick. Every summer a box of Kay’s outgrown clothes would arrive at our house through the mail. That was better than Christmas! I’ll never forget how happy I would be when that box came and what fun I had trying on the "new" clothes I got from Kay. Clarence Stewart and wife Mary Lou, Buford Cockrum and wife Virginia, Harlan Langford and wife Velma were six people who I consider as the real deal. By the way, there are not many people I put in that category either. The lives they lived outside their involvement with First Baptist Church were genuine, not just reserved for Sundays at church. All six were wonderful people to me and each one have always held a special place in my heart. I remember with great fondness some teachers I had in grade school, in particular Mrs. Flossie Wilmoth and Mrs. Euretha Miller. Mrs. Flossie’s class was always lots of fun because she included lots of art work. I especially remember that we did a lot of painting on glass when I was in fourth grade. Euretha Miller (now Euretha Williams) encouraged me to read, and I’ll always be grateful for her influence in that way. Miss Margaret Miller, Mrs. Katherine Hale, and Willie Hugh Bilbrey are among my favorites in high school. Miss Miller was pretty stern, but underneath it all, she had a very big heart. Mrs. Hale was always a very pleasant person to be around and made learning very easy. I really enjoyed being in Willie Hugh Bilbrey’s class. He always incorporated interesting stories in his teaching which somehow tied in with the lesson. I especially liked the neatness in the way he presently the lessons to us, especially in bookkeeping. Mrs. Martha Copeland and Mrs Lucille Hyder were teachers that I considered to be very strict, but created a real desire in most of their students to achieve and do well in their classes. They were both excellent teachers. Another teacher I had in high school gave me some advice I couldn’t quite figure out what he meant by at the time, and it was years later before I knew why he told me this. His exact words were "you don’t want to marry an ole Sells!" I had no idea at the time that his wife’s maiden name just happened to be Sells, the same last name as the fellow I was dating then. Billy Gene Gaw was a pretty good teacher too in spite of the fact he tried to steer me in another direction when it came to choosing my mate for life. Many of the older friends I made as a young wife and mother are no longer with us, but left their mark on my life. Virgie Jolly and Grace Bilbrey are at the top of the list when it comes to memories of happy times shared with each of them. I treasure the times I spend with these two wonderful ladies. My Aunt Rose McCormick, my Great-Aunt Cleo Draper Sayer, are also two people that I cherish my memories of. My in-laws, Herman and Lucille Sells, were salt of the earth people and eventually accepted me into the family in spite of the fact that I grew up in town. With their help, I learned a lot about living in the country. I’m sure I’ll read this later and will be asking myself how in the world I could have unintentionally left other names out that meant a great deal to me. To sum exactly how I feel about lasting memories and more important ways to be remembered can be found in a story I read a couple of years ago written by John Rice Irwin, the founder of the Museum of Appalachia in Norris, Tennessee. Mr. Irwin wrote about his Granny Irwin, someone who came from a family of eleven children, and never had time for what he referred to as frilly, artsy things. She worked hard growing up helping her mother do the "woman’s" work for her nine brothers and her father. Her much older sister had married and left home when Granny Irwin was still very young. Many years after Granny Irwin had died, John Rice Irwin became aware of a Christmas quilt Granny had made, and after inspecting her work, he saw how she had stitched the name of some of her relatives on the quilt along with the Lord’s Prayer that was placed in the center portion. 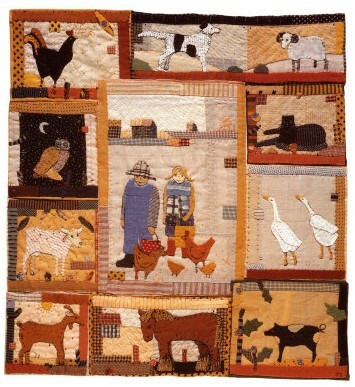 Since she had raised chickens all her life, and eggs were her only source of income, she had included chickens, ducks, and a strutting rooster on her beloved quilt. She dearly loved music, and she had depicted musical instruments, including a fiddle and a Jew’s harp. John Rice Irwin had often heard his Granny loved riding sidesaddle in her youth, so it was not surprising to see a horse as part of the collage. But the most dramatic feature on the quilt consisted of only two words, and when Mr. Rice read them, he told how he was overcome with emotion. Those two words were simply: "Remember Me." Mr. Irwin described the women of his Granny Irwin’s day as having little identity of their own. They were always known as Mr. So and So’s daughter, or Mr. So and So’s wife, but never as the individual persons that they were. Although his Granny was happy and content to love and work for others, she, like the other women of her day, would leave little for which they could be remembered. Had it not been for the Christmas quilt, there would have been nothing personal and physical to indicate that Granny had ever lived. He felt that perhaps his Granny sensed this and unknowingly left the two-word message so that she would not be quickly and totally forgotten. I just don’t believe those who might have what could be considered the highest degree of education or have powerful political influence in today’s world and have gone to great lengths to be immortalized forever will be those most remembered after this life is over. Even though an excellent education, or wealth and the power that might come with it can buy a lot of worldly things, it can never leave a mark like the life this simple country woman did by such a small gesture. It’s my opinion that people like Granny Irwin will definitely be among those people who are first in line to receive recognition for a life well lived. Just those two simple words ... "Remember Me" ... she couldn’t have made a more profound and lasting impression. Even her name on a building in her honor wouldn’t have done what her handmade quilt accomplished. To me, that’s what is all about. I can only hope some small deed I’ve done or will do in the future will stay in the hearts my grandchildren like that of Granny Irwin, and will serve as a loving memory to carry with them all their lives. I don’t think there could be a better or longer lasting tribute than to be remembered in that way. This photograph of an antique quilt is probably similar to the one made by John Rice Irvin's Granny on which the words "Remember Me" were included.